Pioneers in the industry, we offer rubber u channel gasket, srp 154 rubber tube and silicon red strip from India. Backed by our team of meticulous professionals, we are instrumental in manufacturing and supplying high performing U Channel Gasket. 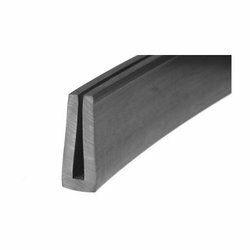 Our offered channel gaskets are second to none in terms of its flexibility in wide temperature range. We use advanced molding and extrusion techniques to fabricate customized gasket channels in U shape developed from premium grade Silicone, Neoprene, Viton and Buna-N material. Further, the offered gaskets can be ordered in custom compounds at an equitable price. We Are Leading Online Manufacturer And Supplier OF SRP 154 Rubber Tube. We have gained prominence in the domain by manufacturing and supplying high in demand Silicon Red Strip. We are engaged in leveraging leading technology to process silicone strips featuring high temperature stability and longevity. Featuring remarkable elongation properties and superior stretch repeatability the offered strips are developed from quality tested material and can be ordered from us in varied colors at a nominal price.